by Meg Corey (or is it Meg Chapin now? ), from Sheila Connolly's Orchard Mysteries. Seth and I got married, in case you haven't heard. We held the wedding at Gran's restaurant in the heart of Granford, and my friend and mentor Christopher officiated, with a special license. It was exactly the small wedding we wanted, with our families and friends gathered around us (and good food!). But we forgot to plan a honeymoon. It was a December wedding, because I was busy with the harvest and preparing my orchard for winter, and Seth was trying to wrap up a variety of home renovation projects before it got too cold to work outside, and going somewhere after the wedding kind of slipped our minds. Good thing we're both workaholics. One thing we're not is the type of people who can go sit on a beach and sip alcoholic beverages with little umbrellas and fruit in them. Neither of us does "lazy" well. So when we finally sat down, the day after the wedding, and talked for the first time about what kind of thing we would like to do to celebrate our marriage, I suggested Jefferson's Monticello. It seemed like the perfect blend of historic architecture (for Seth) and a historic orchard (for me), and we could drive there, with a few stops along the way. And all of a sudden, we had a plan! And off we went. We did make a few side trips to other interesting places, and we took our time. There were some happy surprises. And Monticello definitely lived up to its reputation. Did you know that Jefferson planted his orchard before he even started building his home? It was important to him, and he put as much thought and care into planning it as he did into his intriguing house. It was the perfect honeymoon for us. At least, until my mother called to say they'd found a body in the back yard at their New Jersey home, and maybe it wouldn't be a good time to stop by and say hello on the way back. Well, as you might guess, a body didn't stop us, and we set off the next morning to see if we could help (you might recall that Seth and I have had a bit of experience with murders). Both Seth and I learned some unexpected things about my parents, but everything ended well, and we headed back to our Massachusetts home. Apparently we just can't seem to do things the way other people do--but we're well matched. Meg and Seth's wedding took place in A Gala Event, released last October. 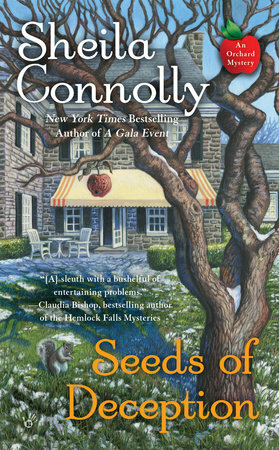 Seeds of Deception (Orchard Mystery #10) will be released in October 2016. I'm sure you'll want to see how I can fit Thomas Jefferson and the Mob into the same story! I honestly cannot wait to read Seeds of Deception, Sheila. You KNOW how much I love this series being a New Englander AND a huge fan of this series, and all if your wruting, but this series was how I got to know you, so it is my favorite. I would be delighted to read and review in advance if you need someone to do that. I can't tell you how long it seems between these books wondering what Meg and Seth are up to as you make them come to life so well. I wonder if they will be heading to Ireland and staying in a cottage and making tea using a purple teapot someday?? Did I say how much I love this series?? I've read and own most of Sheila's books excluding the ghostly 3 book series (I really don't like e-books) and can't wait for this new Orchard book to come out.